This week, we’ll finally be unveiling our new UI. I made a video preview of it below; check it out! There’s already a feedback thread up on the Prismata subreddit. Feel free to share any of your thoughts with me (good or bad), I will read everything in that thread! 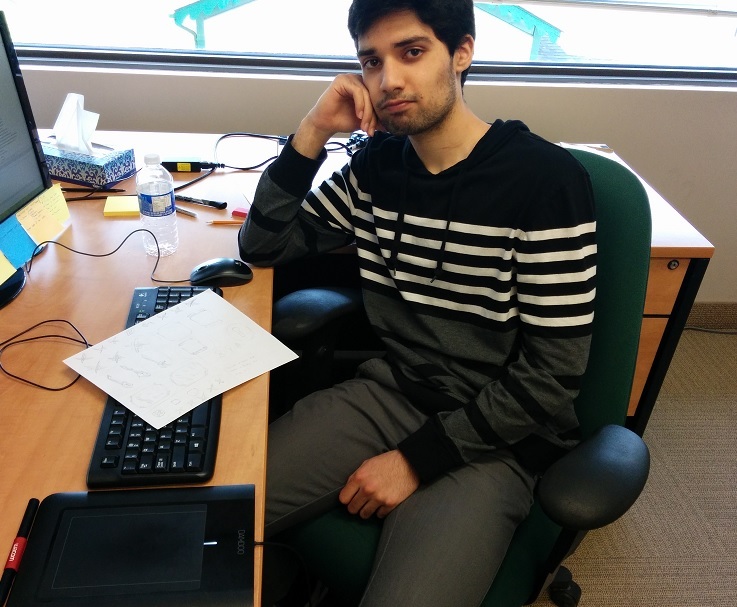 Welcome Talha, one of our new summer interns. Unlike most of the rest of us, Talha can actually make art and draw stuff. He’s gonna be creating shiny particle effects, animated emotes, and all kinds of other cool stuff. Talha looking like a real badass. If you ENHANCE on the piece of paper on his keyboard, you might just be able to make out some new in-game graphics being sketched out. As you can see, we even let our interns have access to sunlight. Last week, we announced three new units. We actually also hinted at a fourth in this post (hint… press CTRL+A). The fourth one… well, I uploaded its image with the other three above. We’ll continue improving the user interface, adding more functionality and improved graphics. Once all the new art goes in, we’ll start improving the efficiency of the engine and graphics so Prismata eats less CPU. When David Rhee joins us full time later in May, he’ll be working on fixing all the asset loading and memory leak problems (yes, we know about them, and they have caused all kinds of amusing bugs like Bearsuit playing blind Prismata). We’ll improve server stability and efficiency, and do A LOT of server testing (we hired a new intern just for this, and he’s starting next week!) We will test and test until we’re confident that the server can support thousands of players online simultaneously. We’re pushing back the full launch of arena mode further because we want a bit more time to refine the charms system. A simple version of arena mode will be available when we launch the new UI, but rewards will be limited. Charms and the rest of Arena rewards will launch once we’re confident that the collectibles and reward systems work well. Maybe a week or two. We’re still adding art. Payment systems will go in once we’re happy with how rewards are working, and there will be a test period. When you start out as a new player, you’ll get an interactive, well-thought-out tutorial experience. We’ve been working on this for literally more than a year and have tested dozens of versions of interactive tutorials with hundreds of new users. Prismata is a simple game, but players who misunderstand the game’s unusual mechanics can easily become frustrated, so building a good tutorial is extremely important (and difficult!) We hope to have something worth showing in the next few months. Dave will be working on more bots with different personalities and building styles (like an aggressive bot, an econ bot, a bot that loves Conduits too much, etc.) These bots will be available as opponents for newer players on the ladder, or potentially their own “bot ladder” or something of that sort. Details to follow. There will be a progression system. You’ll “level up” and unlock more units and in-game features as you play for the first few hours. This will help to pace the early Prismata experience a bit better. Casual Match will be added very soon; you’ll be able to play against other players without the ladder anxiety. Once we’re in a good position with our new player experience and our progression systems working well, it will be time for a party, right? Well yeah, pretty much. We’ll be gearing up for a big event in the summer. We’ll be making a new trailer, doing a press release, buying ads, and getting a boatload of new players into Prismata. We also hope to announce a Grand Prix circuit that will feed into a Prismata Alpha World Championship event toward the end of 2015. As for Raids, Alex has been trying to convince me that we should launch a super-experimental prototype for folks to try on the Alpha server. We’re still thinking about how such a prototype might work, but after running our April Fools test last month and learning quite a lot about what people liked and disliked, we think some additional experiments probably aren’t a bad thing. No promises, though! I’ve said this before, but I honestly have *no idea* when we should put Prismata on Steam. I’ve talked to some developers who’ve had great success with Steam Early Access and actually earned enough funds from it to allow them to hire more developers! I’ve also seen many examples of games that I feel should have waited until their product was more polished. What do you guys think? If you have thoughts about Steam or new features or anything else in this post, let us know on reddit. That’s all for now, see you next week!